We had a bit of a dodgy start. One person, after packing and preparing to go, couldn’t make it to the meeting point because the retaining pin failed on his bike trailer on the way out the door. Within the first five minutes of pedaling west on the Embarcadero, another person was pooped on by a seagull. Fifteen minutes after that, another person’s crank fell off of their bike. But it got better after that, mostly. We left Stuart behind, whose crank fell off. But he was next to Chrissy field, where there was a bicycle shop that was able to help him get it back on. Not only did Stuart catch up with us, he somehow managed to pass the rest of the group, meeting us again in Stinson Beach. The second-biggest hill on the trip is around Mt. Tam. It was long and moderate grade. Several carbon-fiber speed demons cheered us as they passed. In my experience, they don’t normally do that, so I’m guessing it was the camping gear that inspired them. 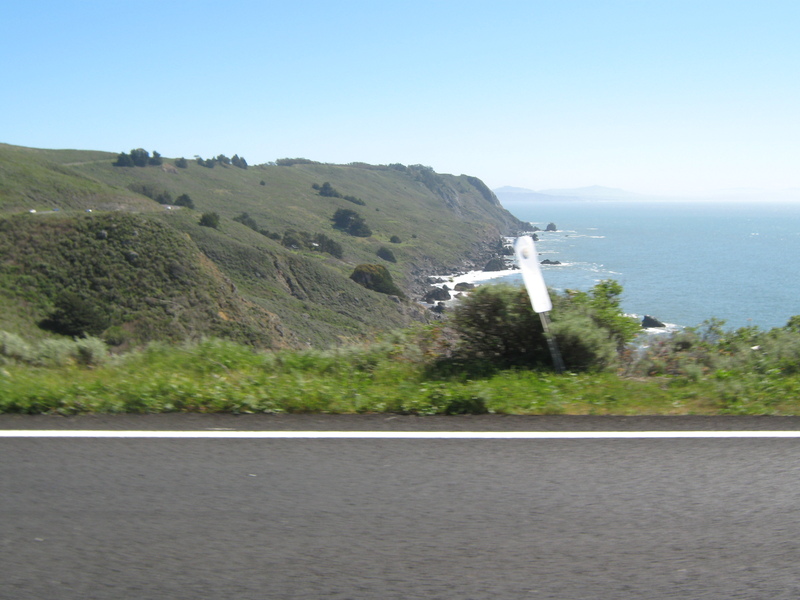 Past that hill, there is a section section of Highway 1 between San Francisco and Point Reyes that I have often drive on, but I was never able to appreciate its majestic beauty until I was biking on it. That’s partly because the view is mostly out the passenger’s window going north, and you can’t really see it as much going south. But mostly it was because the road is so windy that, while driving, I could only look for a half a second at a time or else risk driving off the road. 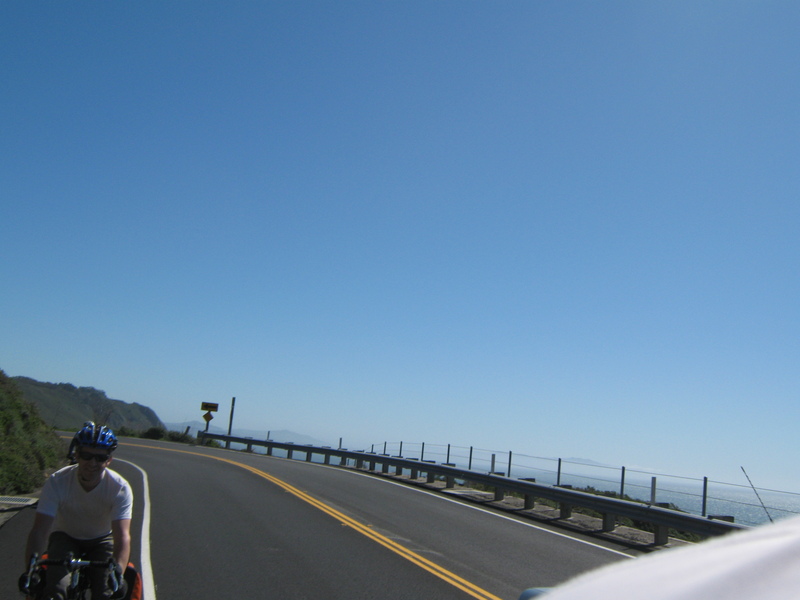 On a bicycle, it was like being in a slow-moving convertible: all blue skies, cliffs, and ocean. Stinson Beach had a nice park for lunch, which we ate at around 1:30 or so, before proceeding with the final stretch north into Point Reyes. It is nice, but less remarkable than the section south of Stinson. After picking up our campsite permit at the Bear Valley Visitor Center, Limontour Road was another slow, steady uphill before turning up onto the fire road that leads to Sky Camp. Sky Camp is named appropriately, and a couple of us chose to walk rather than ride. But it is fairly well graded, and with fat-ish tires (say, 30mm or greater) and a bit of mountain biking skill it is possible to ride up it. Make sure your tires are fully inflated to avoid a pinch flat. 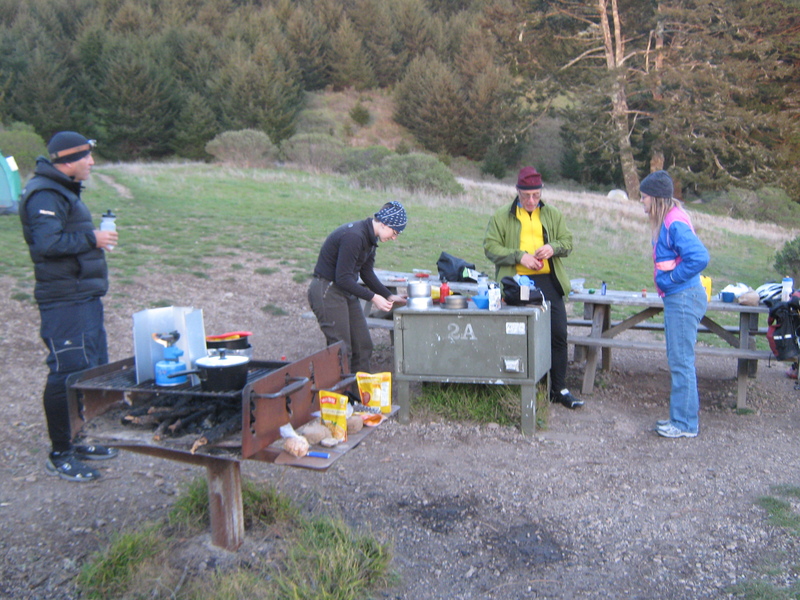 We had group site #2, which gave expansive views over Drake’s Bay, and there was a flashing light after dusk that didn’t move and we took to be the Point Reyes Lighthouse. There was only one other group campsite, and they only had one tent and were very quiet. So it was a good camping experience — lots of space, no other people that we could hear. Cooking up a storm at Sky Camp. Most people had Tasty Bites for dinner, and we did some spotting of constellations afterward with a star chart: Orion, Cassiopeia, the Pleiades, Leo, Gemini, and I’m sure a few others. On the way back, we all — well almost all — really enjoyed a bit of mountain biking on the way down the fire road. Sir Francis Drake was busy, but in many places there was a wide shoulder where it was possible to ride two cyclists abreast and have a conversation (shouting above traffic noise, anyway) without feeling too exposed to traffic. We regrouped and ate a delicious lunch at Punjabi Burrito, across from Sunshine Cyclery. From there, we split up: the rest of the group decided to bike back across the Golden Gate Bridge. I was lazy and one of my knees hurting, so having another hill and 15 miles didn’t sound so great, so I instead stuck with the original plan to take the Larkspur Ferry back to the city. 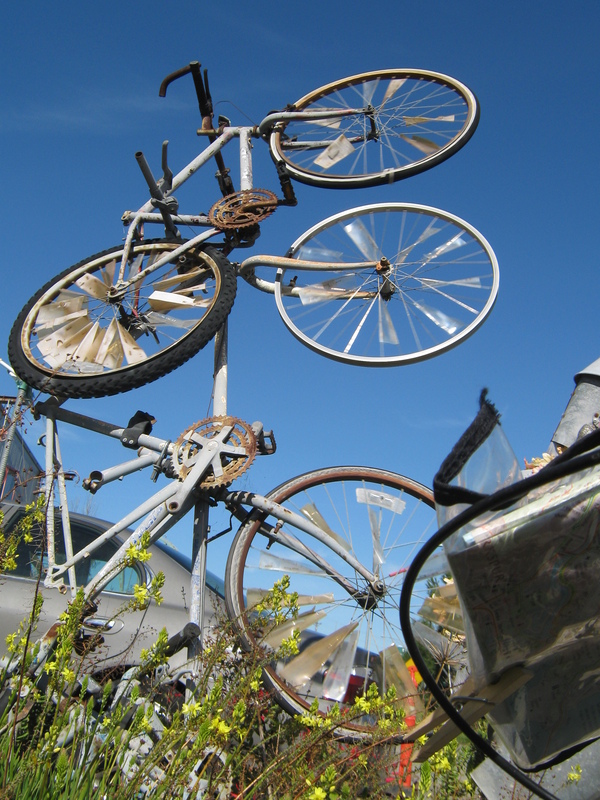 Bike windmill sculpture in front of an apartment building in Fairfax.